1943 January 1943 W.C.T.U Meets Tuesday The W.C.T.U. will meet at 2:39 Tuesday January 19, at the home of Mrs. John Evans, 1119 Park St. The guest speaker will be the the Rev. Mr. George Evans, pastor the First Friends' Church. Iowa Prohibition Party Founder Dies Des Moines - AP - Alexis U. Coates, 84, who in 1885 organized the prohibition party in Iowa, died Thursday night at his home. As the prohibition party's candidate for governor in 1901, Coates polled the largest vote ever cast for a candidate on that ticket. Jan. 23 1943 Mrs. Evans Hostess to W.C.T.U. Meeting 1943 The January meeting of the Women's Christian Temperance Union was held with Mrs. John Evans. Mrs. George Evans led the devotionals, reading from the 119th Psalm. Mrs. George E. Mitchell presided over the business session. 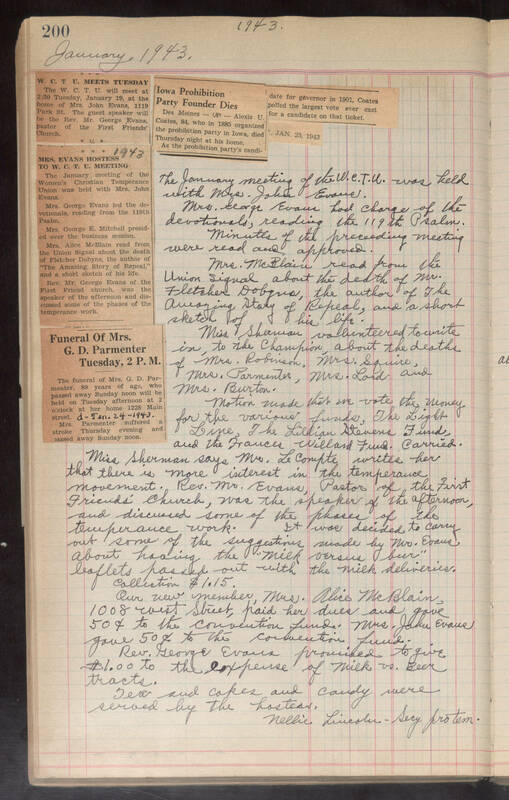 Mrs. Alice McBlain read from the Union Signal about the death of Fletcher Dobyns, the author of "The Amazing Story of Repeal," and a short sketch of his life. Rev. Mr. George Evans of the First Friend church, was the speaker of the afternoon and discussed some of the phases of the temperance work. Funeral of Mrs. G.D. Parmenter Tuesday 2 P.M. The funeral of Mrs. G. D. Parmenter, 89 years of age, who passed away Sunday noon will be held on Tuesday afternoon at 2 o'clock at her home 1228 Main Street. d - Jan. 24 - 1943 Mrs. Parmenter suffered a stroke Thursday evening and passed away Sunday noon. The January meeting of the W.C.T.U. was held with Mrs. John Evans. Mrs, George Evans had charge of the devotionals, reading the 119th Psalm, Minutes of the preceeding meeting were read and approved. Mrs. McBlain read from the Union Signal about the death of Mr. Fletcher Dobyns, the author of The Amazing Story of Repeal, and a short sketch of his life. Miss Shannon volunteered to write in, to the Champion, about the deaths of Mrs. Robinson, Mrs, Squire, Mrs, Parmenter, Mrs. Lord and Mrs. Burton. Motion made this we vote the money for the various funds, The Light Line, The Lillian Stevens Fund and the Frances Willand Fund. Carried. Miss Sherman says Mrs. LeCompte writers her that there is more interest in the temperance movement. Rev. Mr. Evans, pastor of the First Friends' Church, was the speaker of the afternoon, and discussed some of the phases of the temperance work. It was decided to carry out some of the suggestions made by Mr. Evans about having the "Milk versus beer" leaflets passed out the with milk deliveries. Collection $1.15. Our new member Mrs. Alice McBlain, 1008 West Street, paid her dues and gave 50¢ to the convention fund. Mrs John Evans gave 50¢ to the convention fund. Rev. George Evans promised to give $1.00 to the expense of Milk vs. Beer tracts. Tea and cakes and candy were served by the hostess. Nellie Lincoln - Sery protem.